On Wednesday, January 23rd Caroline, our intern from Concordia College is teaching us how to make traditional Ojibwe dream catchers. A traditional Native American dream catcher is made of a round hoop, woven with a loose web of yarn and decorated with beads and feathers. Legend has it, that they were hung above the beds of sleeping children to protect them from bad dreams and evil spirits. Those bad dreams would be caught in the web floating above their heads. As the first rays of the morning light hit the dream catcher, their bad dreams would disappear. Today it serves as a general symbol of Native American culture. 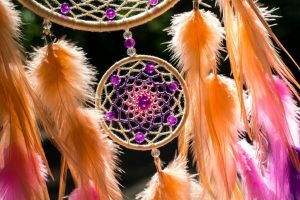 Come to Caroline’s class at the end of the month to not only create your own dream catcher, but to learn more about its significance in Native American culture.